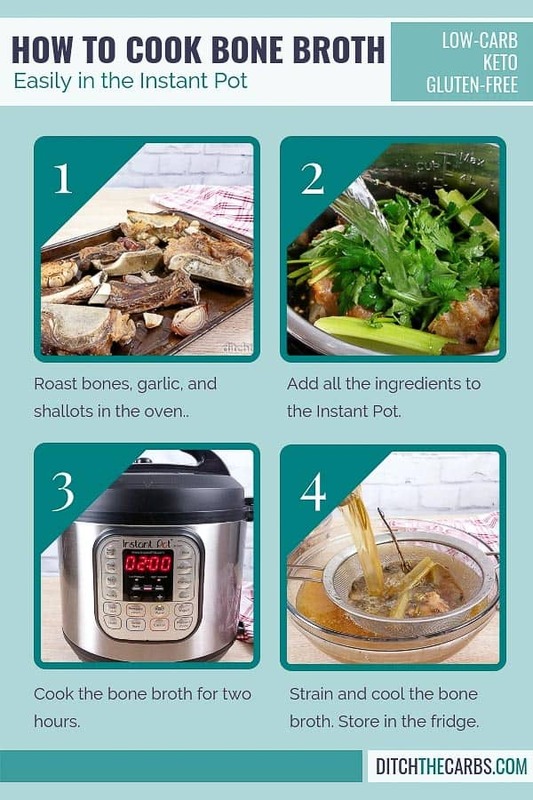 Instant Pot beef bone broth is full nutrients that promote gut health. 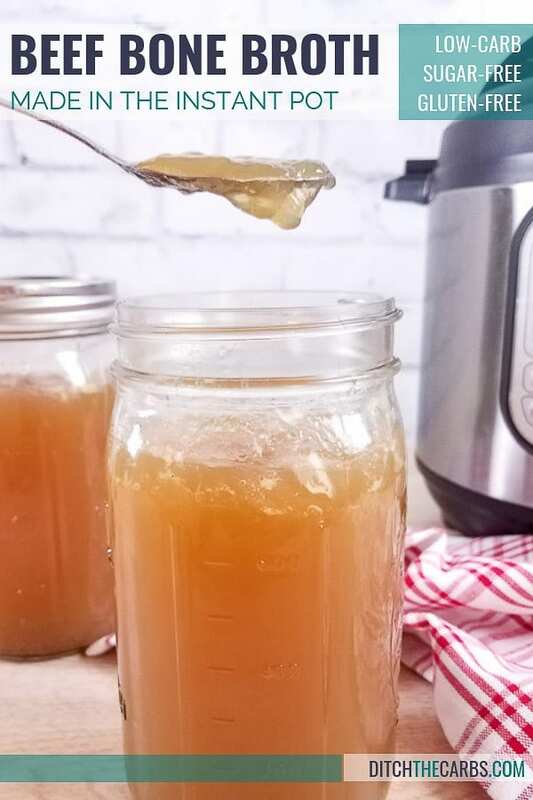 Typically the process to make bone broth can take multiple days. 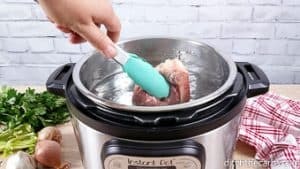 However, with the help of the Instant Pot, you can make delicious beef bone broth in only a handful of hours. 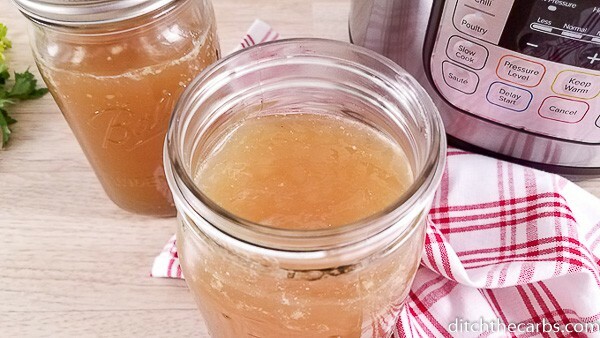 Beef bone broth is wonderful for cooking or drinking hot by itself. 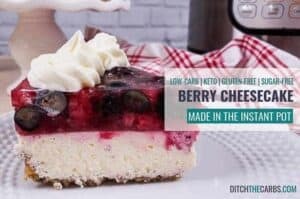 It is full of healthy nutrients, collagen and amino acids that can boost your immune system, aid in detoxing, improve joint health, and so much more. However, buying quality bone broth can get quite expensive. 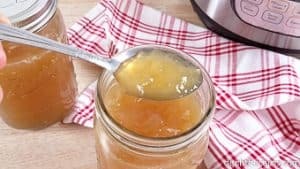 The cost of making bone is minimal, and you are able to produce a large amount of broth for a much lower cost than the equivalent amount of store bought bone broth. And with homemade beef broth, you know exactly what goes into it. 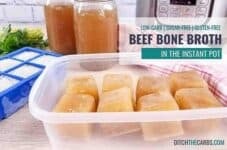 When making this bone broth I kept the recipe simple by using regular beef soup bones and a few spare rib bones. If you have access to affordable oxtail, feel free to toss a few into the recipe, but depending on your location that may not be an option. So if you cannot find don’t stress, just make the recipe as is. The first step to making beef bone broth is to boil the bones for about 15-20 minutes. By boiling the bone you allow the impurities to be released from the bone. This is all the yucky white stuff that tends to float on top. I use my Instant Pot to boil the bones. Bring the water to a boil using the sauté function and then placed the bones in the Instant Pot. Remember to leave the lid off since you are not pressure cooking at this point. Once the bones are boiled drain the liquid; then rinse off the bones and Instant Pot liner. You don’t want any of the impurities to make it into your broth. The next step is what gives the broth the most flavour. You will want to roast the bones for 20-30 minutes on each side. Roasting the bones is what makes the broth rich in flavour. The longer you roast them, the better and deeper the flavour. You will also want to include some aromatics during the roasting process. I like to toss a shallot and head of garlic on the sheet pan. If you have onions in your pantry you can use an onion instead of a shallot, but I prefer the robust flavour of shallots in my broth. Drain and rinse the bones. 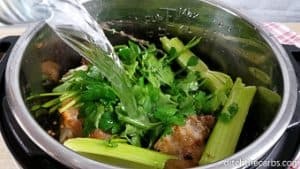 Add bones, celery, herbs, and seasoning to Instant Pot. Cook for two hours. Let the pressure release naturally. Rapidly cool the broth with ice. Store some broth in the refrigerator and freeze the rest. Finally, it is time to cook the bone broth. Dump all those roasted bones and aromatics into the Instant Pot. Add some celery, herbs, and seasoning. 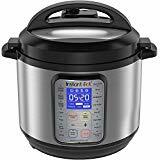 Then fill the Instant Pot up with water. 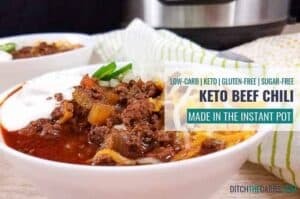 This is where the Instant Pot does its magic. The broth will be done in about 4 hours compared to the regular 48 hours it takes on the stove. 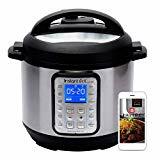 It will take about an hour for the Instant Pot to come to pressure, two hours to cook, and another hour for the pressure to release. Sometime when I am short on time I will make the bone broth in stages and then store in the refrigerator. I may boil the bones one day, roast the next, and then cook the broth the following day. 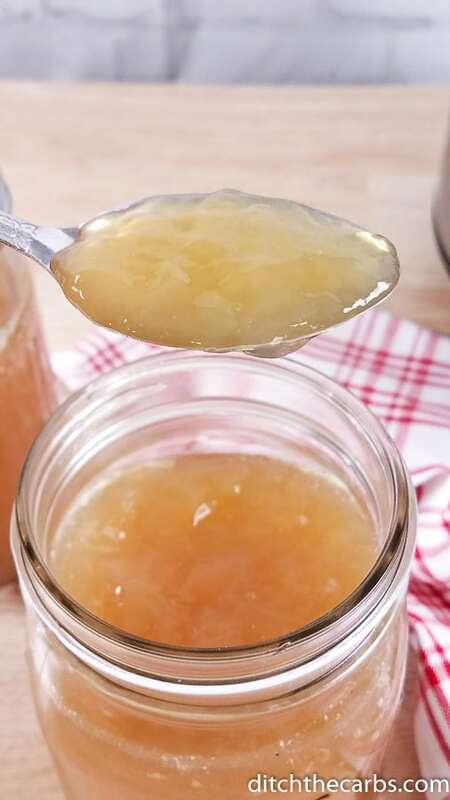 Now that you have made a pot full of bone broth, you need to strain it into a large clean container. After the broth has been strained I like to rapidly cool the broth by adding a cup of ice to the broth. This is a tip from a chef friend of mine. 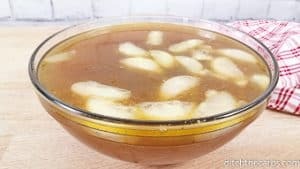 When the broth cools slowly it is more likely bacteria will begin growing in the broth. Rapidly cooling and storing the broth will prevent the bacteria from growing. I store the broth in both the refrigerator and the freezer. I will keep about a quart/litre of broth in my refrigerator at a time for 5-7 days. 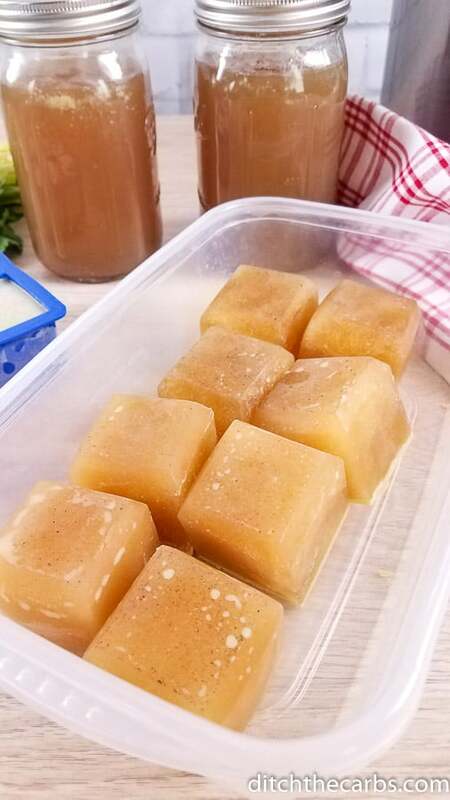 The rest of the broth is measured and frozen in large ice cube trays. 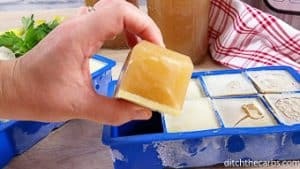 When I need to use the frozen broth I will remove a cube or two and defrost in the microwave or on the stove. 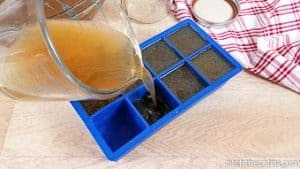 Since the broth is premeasured I know how much broth is in each ice cube. And that’s all it take to make beef bone broth in the Instant Pot. I hope you enjoy it. 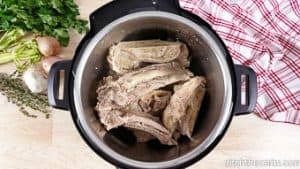 Nutritious Instant Pot beef bone broth is loaded in flavour and takes 1/4 of the time. Fill the Instant Pot insert about 3/4 of the way with water. Press the saute button and bring the water to a boil. Once the water is boiling, add the bones. 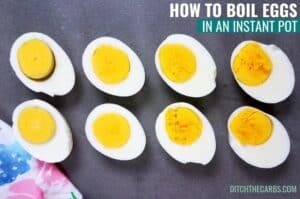 Allow the bones to boil for 20 minutes. This will release the impurities from the bone. Then drain the liquid and rinse off the bones and Instant Pot insert. Arrange the bone, shallot, and head of garlic on a sheet pan. Roast the bones at 450 degrees F for 20-30 minutes on each side. When the bones have finished roasting, add them to the Instant Pot with the garlic and shallot. Be sure to include any drippings from the pan. Add the remaining ingredients to the Instant Pot and cover it with the 3 litres / 12 cups of water. Close the lid and turn the pressure valve to sealing. Using the "Meat/Stew" button cook the broth for 2 hours. Let the pressure release naturally. It will take about an hour to come to pressure and another hour to release. Strain the broth into a large clean container. Add a cup of ice to rapidly cool the broth. When the broth is cool pour some broth into an air tight container to store in the refrigerator. 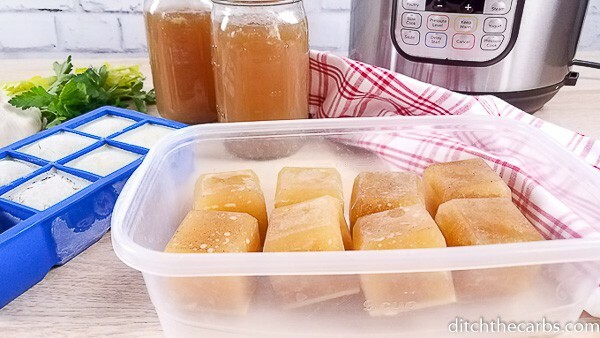 Freeze the remaining broth in premeasured portions using a large ice cube tray. The broth in the refrigerator will last 5-7 days. The broth in the feezer will last 3-6 months. Keep or discard the fat debate? 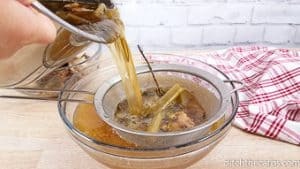 You can discard or keep the fat as shown in the video when you want to get to a portion of the broth below. Some love to enjoy the fat that results from a bone broth, others claim the fat is oxidised due to it's long cooking time. 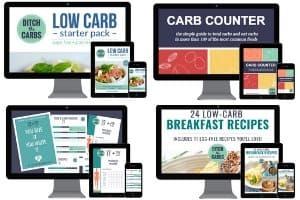 It's up to you whether you discard or keep the fat. 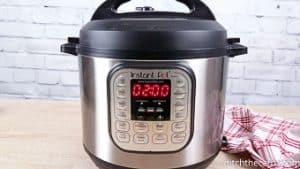 Hi, can I use a pressure cooker instead of the Instant Pot? Sure thing! 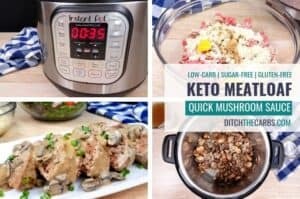 An Instant Pot is a pressure cooker, slow-cooker and saute’s all in one. But a pressure cooker will work just fine. 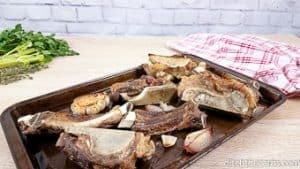 If I am using bones that have been cooked as part of a roast and then frozen, do I need to still do the initial boil and roast? Thanks for your time! You can avoid the first part – yay! I really enjoyed making this recipe without too many ingredients. Bone broth came out rich and extremely flavourful. What were your beef soup bones from? We have nut allergy in the household,so I find it difficult to find ingredients that are not cross contaminated. Can you pls give us viable solutions for getting around that. Video shows salt, but ingredient list does not…?